Nana’s Baby Equipment is here to help you avoid the stresses of packing playpens, strollers, toys, and other baby gear for your trip to beautiful Kauai, Hawaii. You and your little ones will enjoy my great selection of brand-new baby equipment rentals and beach equipment rentals. 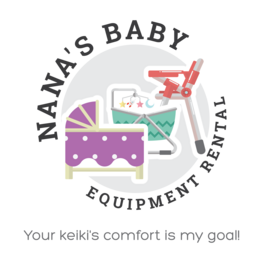 My baby equipment rentals include quality cribs, sturdy high chairs, and so much more—and everything is tested for safety before delivery. If you’re planning on heading to the beaches, browse my collection of beach equipment rentals! Your keiki will love my assortment of fun toys, floats, life vests, and sun shelters. Find great entertainment for your little ones at affordable prices. If you have any questions about any of my rentals, please don’t hesitate to contact me. "Sharron at Nana's Baby Equipment Rental saved our night! We called our hotel in advance to insure they had a pack and play for our toddler. They said they did. After we checked in, and were in our room waiting for the bed to arrive, as my toddler was on the edge of melted down before her (travel delayed) afternoon nap, we got a call from the front desk... they had no more beds. Panic mode set in. My husband looked up baby rentals while I tried to console our crying toddler. The first place we found would not take phone calls and had a ridiculously lengthy online form that was nearly impossible to fill out on our cell phones, our computers were left at home. Then we found Nana's Baby Equipment, called and left a message, and before I could even walk to the car to attempt that nap, Sharron called back. She had a bed! She would deliver it to our hotel by4pm! She would pick it up the next day, on her day off. SHARON SAVED OUR NIGHT! And she did it with a genuine smile and a sincere desire to help.